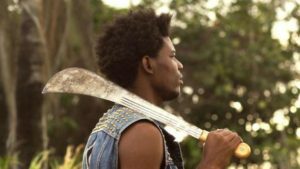 A Gothic punk Caribbean love story arises in the ruins of a coconut plantation in rural Trinidad. English girl Asha, returning to her Indo-Caribbean family home, is drawn to Roger, the Afro-Caribbean boy across the road. Her Auntie forbids their relationship, while her uncle is oddly aloof. The taboo attraction between the two teenagers grows despite family disapproval, political turmoil, a clash between cultures, and mysterious hauntings by unnaturally tall ancestral spirits. Identity and the desire to connect with one’s roots are boldly interwoven between superstition and spirituality. 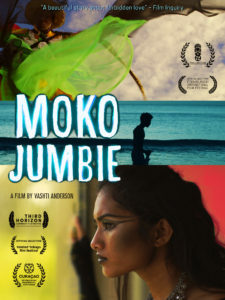 If you follow your heart in the Land of Sugar, you might find MOKO JUMBIE.